UFC officials made the announcement that UFC on Fuel TV: Franklin vs. Le is now set, as the promotion will invade China for the first time. The card takes place November 10 in Macau, China. 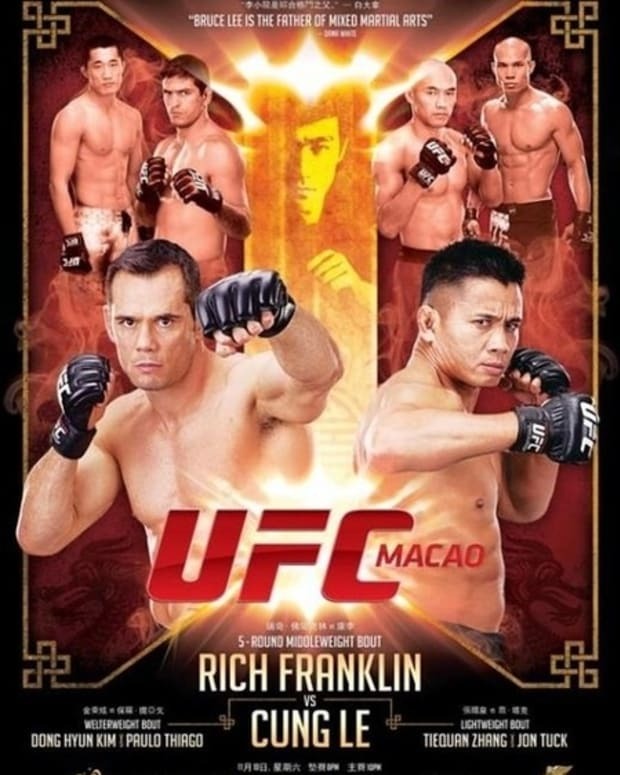 Rich Franklin, a former UFC champion, will meet Cung Le, an ex-Strikeforce champ, in the main event. Franklin (29-6) and Le (8-2) were expected to collide earlier this year, but "Ace" opted into a bout with Wanderlei Silva instead. Also made official for the card are matches between Dong Hyun Kim (15-2-1) and Paulo Thiago (14-4); Stanislav Nedkov (12-0) and Thiago Silva (14-3); and Tiequan Zhang (15-3) and Jon Tuck (6-0). The main card will air on Fuel TV, with the prelims to stream via Facebook. The event takes place in the CotaiArena in Macau. Vitor Belfort On Fighting For UFC Title: "Priceless"
Cung Le vs. Rich Franklin to Headline UFC on FUEL TV 6?